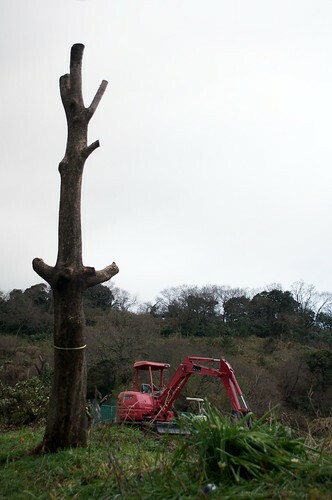 The Japanese are famous for the careful aesthetics they employ in tree pruning. Unfortunately, in March, much of Japan has money to burn. I have no trouble with the four men who spent three days up the handful of pine trees at a local cemetery using chopsticks to plucking out every third needle, but that act just make the contrast with the inability to control the violence of the chainsaw even more disturbing. A few years ago it was the islands in the ponds at Hachimangu that got this treatment. 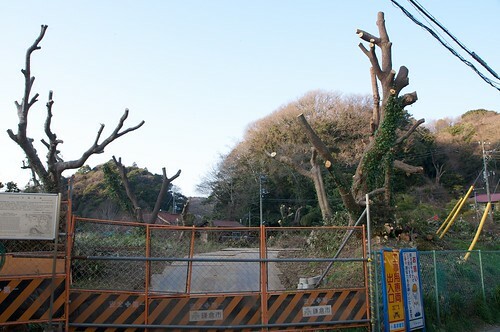 This year it is historical-y site of what was probably the seat of power in Kamakura (just down the road from our house) that is being...cleaned up. As well as the trees I feel sorry for all the birds, bugs and squirrels so cruelly displaced from home. Since the idea is to spend money I don't see why they don't employ 50 men with scissors instead of 10 with diggers and chainsaws. They could surely more expensively achieve a more pleasing result. What is the price of electricity in Japan these days? Average about US$220 per month. We average ¥5500 = $70 per month for a 4-bed house. But we are hair-shirted skinflints :-) (and the winters are probably less severe). I don't have a bill to hand but I think it's about ¥25 per kWh, $0.30 at current exchange rates. James Annan --- Pricy, thanks.